I have a Bachelor of Arts in Journalism from Indiana University-Purdue University Indianapolis [IUPUI], with minors in religious studies and international studies. I am a Galactic Citizen [Starseed], providing angelic messages, wholistic intuitive healing, spiritual counsel/coaching and teachings. As a Starseed, I was born with past life memory [on and off Planet Earth] and heightened intuition and sensitivities. I interacted with energies and beings as I thought it was normal! [It is normal, by the way.] I blocked most of my gifts, and even some memories, at an early age because of trauma and the public school system but I remained connected, intuitive. In college I desired to pursue my spiritual life to really understand myself and Creator, to remember, and in 2007 when I was 20 years old a series of events took place to shake me awake, and my clauraudience returned. This was hard to live with at first because I could hear everything all at once, it kept me awake at night — I thought I was going crazy. This is how I learned to meditate, to focus on my breath to calm my mind and still the noise. From 2009-2011 I went through many experiences to test me and my soul wisdom, inevitably pushing me to the edge. In 2011 I was reawakened and activated — I decided to stop being lukewarm about my mission on this planet so I surrendered and completely dedicated myself to my healing, spiritual life and purpose. Once I did this, instant knowing returned, my intuition heightened, and I delved into deep spiritual and metaphysical studies, developing my gifts. The Universe led me to Italy in 2013 to work on a travel project but the Universe had other plans! While working on the project I continued to research, meditate, and seek answers, which led me to participate in Charles Virtue‘s first Master Intensive in Italy. During this retreat, I was reunited with familiar souls I recognized from past lives, and I further honed my abilities and unlocked memories. 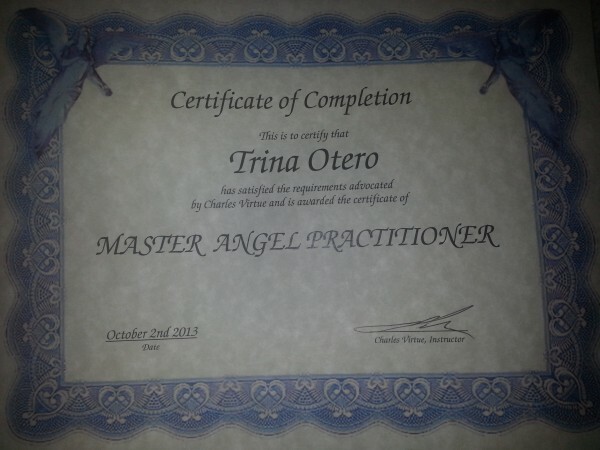 I received my certificate — I am a certified Master Angel Practitioner. 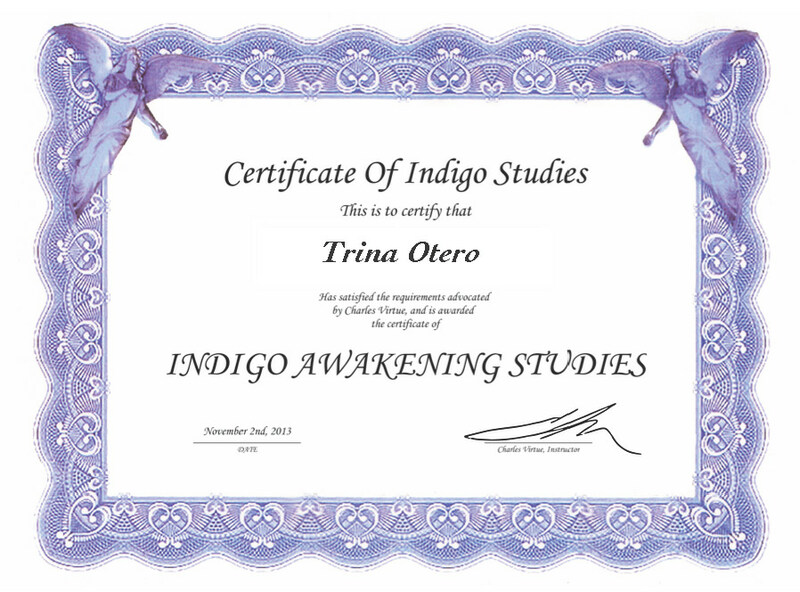 I am also certified in Indigo Awakening Studies, which I also received my certificate from my fellow Indigo teacher Charles Virtue, 2013. I felt this was extremely important, since I recognize that many Indigos/Starseeds have been misdiagnosed (with ADHD, Autism) due to our abilities to tune into other realities and our sensitivities to other energies. That was only the beginning. A very transformative year followed, with inner travel and shadow work being the key focus for 2014. This process allowed my intuition to be sharpened and more gifts to [re]surface. Crystals strongly called to me and I began listening and working with them. In 2015 I received the call from Mother Ayahuasca — the opportunity to drink this sacred tea activated my DNA more than I could imagine, ignited cellular memory, provided direct contact with Guides and Galactic Beings, and aided me in fine-tuning my abilities even more. 2016 was a year full of purging traumas and distortions, integrating into my physical form, integrating different aspects and my other half [Video Here]. As 2016 was winding down, I was led to Pranic Healing and received Level I certification. My dedication to my path has unlocked memories, intuitive abilities, and taught me how to heal and empower myself. I have spent the last few years sharing what I have rediscovered and learned, teaching others how they can focus on their spiritual evolution and heal as well! My goal is to empower all those I meet, so that we all can remember who we are, heal and return to our natural state – which is our right – so that we can heal planet Earth and bring her back into harmony as well. Feel free to check out my curriculum vitae here! © 2011-2019 Akosmopolite. All rights reserved. All works published are owned by Akosmopolite, unless stated otherwise. If interested in using any of Akosmopolite’s content, please send an inquiry [check out my contact info!] I love to spread creativity. Aw, I was really touched when I saw this. And I am SO inspired by you. Thank you for being YOU! Hello! Love your energy and your site! We look forward to following you! I like the concept of your blog. I’d be curious to do your horoscope. Hi! 🙂 Really? That sounds really fun. I guess you need my birth date, time and birth place 🙂 right? Yes astrology is pretty fun and insightful and an easy way to empathize with different states. and glad to read you more !! You have a pretty interesting life for sure. Sounds like a perfect combination of an interesting life 🙂 I am sure you are having fun with it. Truth is always a wise goal for one in matters of the body AND the soul. In the afterlife, we will be awarded for how much we truly pursued and loved the Truth. Those who seek for Truth more than money, and those who thirst for Truth more than water will find it if they search with all their heart. That’s why “my truth”, “your truth”, or the next guy’s “truth” are of little importance. Humans are imperfect in logic, reason, and ideas. It is THE Truth that matters and sometimes Truth costs us everything. I have found THE Truth. I have spoken to the Creator of the universe and He has forgiven me, loved me, and promised me an amazing afterlife. He visited our planet once two thousand years ago as one of us. We despised His Truth, so He went away. He is returning soon however to be with all those who love the Truth and to reign upon this earth. His Words are more verified, authenticated and recorded than any other historical documents in history (15,000 ancient manuscripts). They have also been found by archaeology, a boatload of fulfilled prophecies (every one 100% accurate to the detail), and even linguistic codes to defy the field of probability and statistics. His Words are quoted by every major religion and even plagiarized by many, but treated unlike any other religious book in that it is the only religious book banned by multicultural schools and governments. The Truth will win in the end and for all eternity. The Truth’s Nemesis wants humankind to be apathetic toward the Truth and instead be mindlessly entertained, because he knows humankind on their present journey will find immense pain in the afterlife if they never accept and trust the Truth with their lives. The Truth will only be found by those willing to search for Him with all their heart regardless of the cost. I pray you find the Truth in your journey. Grace and love to you. Thank you for following and for your wise words! I apologize for the very late response, I’ve been a bit idle from my site for a while. Thanks! As ‘they’ say, it’s better late than never. 😉 Grace! As have I 🙂 So no worries. Nice blog! I will linger longer when I next come up for air. Hello and Thank you! Was this post about her censored speech fiction? You never answered my question on your blog 🙂 thanks again! I would love to talk to you further about Lateral Love, please send me an email to lateralloveaustralia@bigpond.com and we can discuss your queries and talk about Ambassadorship. I like you blog teacher! Is awesome! Es bueno que tu escribas, me gusta lo que escribes! I am the proud father of Trina. As a daughter of a now retired Army soldier, I was responsible for her diverse travels. She was born in Germany in a military hospital which exposed her to the German culture. I often thought the instability in moving from place to place would have had an adverse effect on Trina, but wtih her extroverted personality she adapted well everywhere and made friends as well. Glad to be one of her first bloggers.